The gallery of Bağımsız Sanat Vakfı (Independent Art Foundation) is to open its doors for Bahraini artist Abbas Yousif's latest exhibition "This is Your Name" on March 24. Curated by Hülya Yazıcı, the exhibition can be visited until April 20. Yousif's work enables Arabic calligraphy art to be used with a colorful lyricism to form a painting. 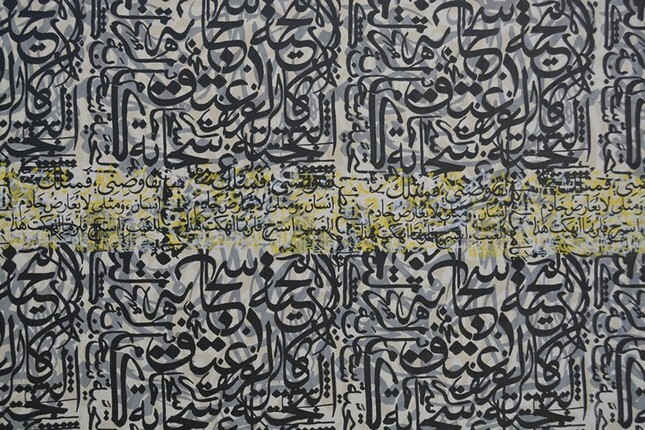 He managed to create his paintings using modern techniques, texts and experiences, which are characterized by intelligence and progress in Arabic calligraphy art. The interaction of thinking, seeing and practicing through the rhythmic blend of uncertainty and abstraction can be clearly observed in the artist's paintings. His works' power comes from their experimental nature, as Arabic calligraphy has an inclination to leave a space between decoration and design. The artist interpreted written text from the works of Amin Saleh, Qasim Haddad, Mahmood Darvish and other Arabic poets in different ways and summarized his vision with graphical texts. These texts control the practices formed by the concepts in the exhibition, such as imaginative power and admiration. The basic components of his huge paintings were created by screen printing, erasing, adding, refining and reconstruction. The artist's visual narration or visual poetry is characterized by its selective contextualization, which implies acceptability surrounded by uncertainty. The uncertainty in the calligraphy created a style that originates from this combination of contradictions. Yousif presents an experience of destruction and reconstruction with a unique color formulation in "This is Your Name." The exhibition is a combination of readable and unexplained words, which evaluates language and words as symbols.